This Western is a notable one from the resume of the legendary Randolph Scott. The production values aren’t quite up to a Hawks, Ford, or Mann film but it distinguishes itself in more than one respect from the rest of the B-Western category. 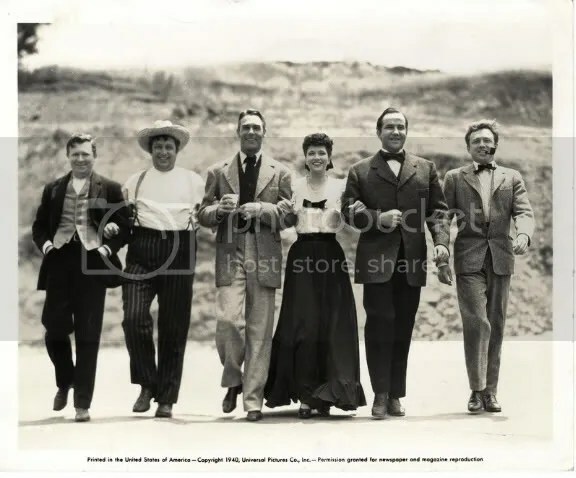 It sports an awesome cast aside from Scott including the female lead played by Kay Francis; and great supporting turns are turned in by Broderick Crawford and Brian Donlevy. The stunts in the picture involving trains are unusually good and quite dangerous as well. The story is a fictional take on the real-life Dalton gang and it puts the viewer in a position to see how they got into a life of crime from their perspective. Lawyer Tod Jackson (Scott) is on his way to establish a practice in Guthrie, Oklahoma when he decides to get off the stage at his old hometown: Coffeyville. Childhood friends of the Dalton brothers, Tod is eager to catch up. He meets a beautiful young woman named Julie King (Francis) while sending a telegraph and is instantly smitten by her. After some amusing confusion over identities, Bob (Crawford) and Grat (Donlevy) insist on Tod staying over so he can attend their mother’s birthday the following day. Much to Tod’s dismay, he finds out that Julie is already engaged to Bob. The brothers relay the current state of affairs that faces their farm: the Kansas Land and Development Company is claiming plots all over the countryside, kicking any existing farmers off the land. The Daltons appeal to the Scott character’s legal expertise in such issues and want the counselor to represent their interests. Things heat up while Bob is out of town as Julie and Tod start seeing each other socially. When Francis’ character confesses her love for the lawyer over her fiance, a conflicted Tod leaves town. One of the heads of the KLDC appears armed with surveyors and he intends to overtake part of the Dalton spread. The brothers confront the trespassers and a melee breaks out with one of the surveyors dying by freak accident. Ben is accused of murder and he’s put in jail pending trial. Having come back to town to help his friends, our hero is prepared to provide a legal defense. When Crawford’s character realizes that the trial is fixed against him, he escapes with the help of his brothers. The Daltons are falsely accused of several bank robberies and they are devastated to learn that their mother’s farm was burned down after they attempted to see her. When they get wind that the railroad is behind all the land grabbing, the Daltons target several trains carrying payroll. This is where the great stuntwork comes in as the brothers are shown jumping via horseback from a car while the train is moving. Also, they manage to board a train @ full speed from their mounts. Very impressive. When the brothers get greedy and attempt to knock off their hometown bank, they bite off more than they can chew. The carnage is complete and with not a Dalton left standing, Tod and Julie are free to pursue matrimonial bliss. When the Daltons Rode really sets itself apart from other Western offerings of comparable budgets. The actors are all quite good — Crawford especially — and the execution of the story is compelling, if untrue, as it paints a portrait of the legendary gang from the late 19th century.